LIST PRICE BUYS 50% INTEREST OR SELLER WOULD SELL 100% FOR DOUBLE THE PRICE. 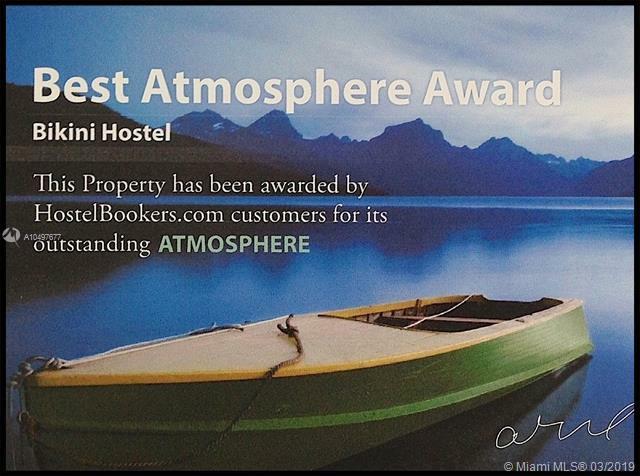 BIKINI HOSTEL, CAFE & BEER GARDEN HOTEL PROFITABLY OPERATING FOR OVER 7 YEARS, WITHIN 11,200 SQ. FT, 35 ROOMS, OVER 200 BEDS, RESTAURANT/BAR WITH 188 CAPACITY, 90 FOOD SERVICE SEATS & 5AM ALCOHOL LICENSE. SITS ON 17,250 SQ. FT. OF LAND THAT HAS DEVELOPMENT RIGHTS TO DEMOLISH THE EXISTING OPERATION AND BUILD THE LAST GROUND UP OPPORTUNITY ALLOWED OF A NEW HOTEL ON WEST AVE. RECENT ORDINANCE RESTRICTS OTHERS FROM DEVELOPMENT IN THE FUTURE. PRIOR PLANS HAD DESIGN REVIEW BOARD, VARIANCE, & ENTITLEMENT APPROVALS FOR: UP TO 6 STORIES, 34,500 SQ. FT, 66 ROOMS WITH RETAIL, RESTAURANT/LOUNGE TO 5:00AM ALCOHOL LICENSE, VENUE SPACE FOR SPECIAL EVENTS & ROOFTOP POOL & CABANAS OR WITH 5 ROOMS LESS, AN INDOOR NIGHT CLUB/BAR. Listing courtesy of The Muskat Group, Inc..